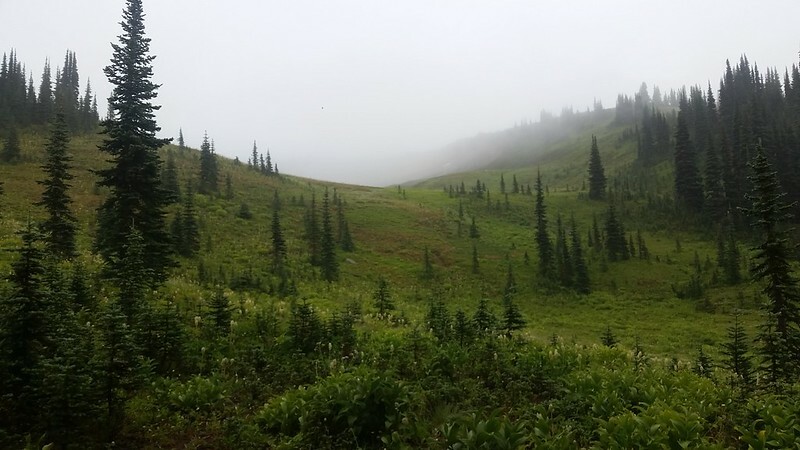 We hiked from Image Lake along the Miners Ridge Trail, Pacific Crest Trail, and Cloudy Pass Trail for 6.6 miles, and arrived at Cloudy Pass where we intended to camp for two nights. This day actually started in the middle of the night, with tiny rain drops spattering on the tent. We lay awake in the darkness, listening to the wind as it shook the tent, the drops smacking louder with each gust. The promised rain was here at last. Now all we had to do was hope that we wouldn’t get too wet and cold. But it was dry and warm in our sleeping bag. We felt quite safe and snug, as a matter of fact. It wasn’t until later on, at dawn, when we had to wake up and pack everything, that we’d discover what the new day would bring. But that was later. Right now, it was pleasant to listen to the drops and the wind. Just the same, after one particularly strong blast of rain, I turned on my headlamp and looked around the inside of the tent, paying extra attention to the corners and edges. Was it leaking? Of course it was! But only a drop or three near one corner, and a few more big drops had landed on the sleeping bag from the air vents on the top. I wiped them up, unzipped the screen doors a bit, then reached up and shut the vents. The water in the corner wasn’t touching anything important so I ignored it. I turned off the light and we snuggled back down into the sleeping bag, listening to the rain. Eventually it lessened and we both fell asleep. The rain came in waves, and I remember waking every so often, briefly, only to fall asleep again. It was a very pleasant rain. When dawn’s light arrived it was still drizzling a bit, so we peeked out the door to discover a soggy, cloudy world. We were in the clouds! Mist was drifting along on a gentle breeze, obscuring the distant trees. At that point, there was only one thing to do: We went back to sleep! It was cold and wet out there! But our rest didn’t last all that long. We weren’t really sure what the storm might do next. It had stopped raining for the moment, so we decided to take advantage of the lull while it lasted. We could handle the gentle misting just fine in our raingear. So we got dressed and packed up what we could inside the tent where it was dry. We only discovered a puddle or two of water out in the vestibule area and it hadn’t soaked anything important. We decided to eat breakfast on the trail, using one of our ready-to-eat meals. When I got outside I said “Good morning!” to our neighbor, who was almost done packing. He had taken the spot under a small grove of pine trees, and the ground underneath them was still dry. He invited us to use this area to finish packing our stuff. This was a great plan. Vicki and I hauled all of our dry gear out of the tent and set it down under the trees. Then we went back, unstaked the tent, and carried it over. We plopped it down in the middle of the dry area. There was no way that it would dry out in this weather, but it sure made it a lot easier to pack up. 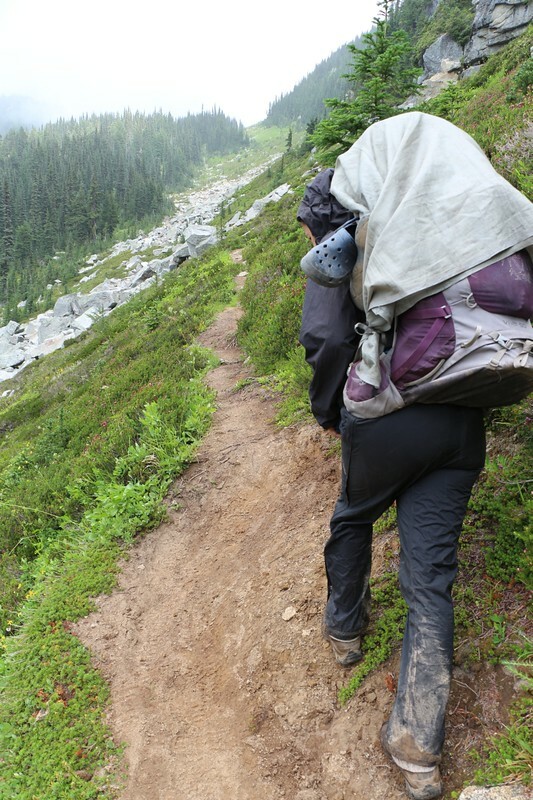 It was soggy and wet and heavy but I loaded the rolled-up tent into my pack anyway. 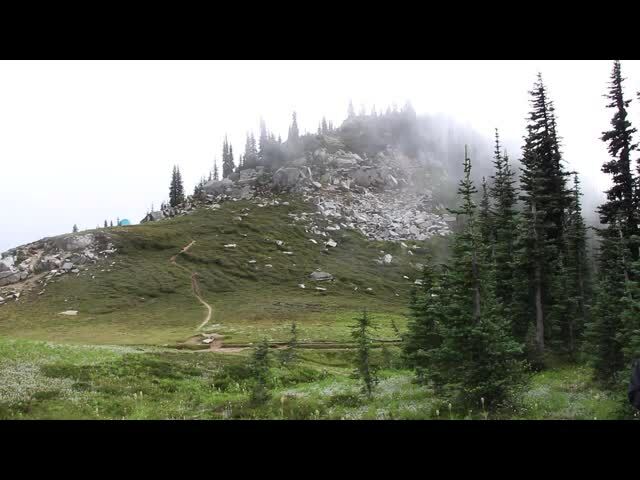 We’d have to dry it out later, when we reached Cloudy Pass. We wished our neighbor well on his hike. 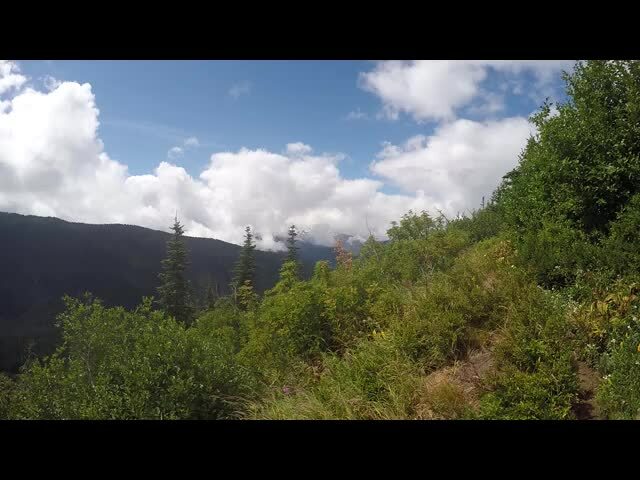 He was heading back to Buck Creek Pass, and was doing the big loop in the opposite direction to us, so we we able to exchange valuable information about our future paths. That’s one of the things that’s great about being out here: Everyone is helpful and awesome. We finished packing everything and got ready to hike. It was quite cool outside, especially in the soggy mist, so we were wearing all of our weather gear plus Vicki had on an extra layer. We even wore our warm hats and gloves. It sounds miserable but it was actually quite pleasant. We were warm, we were dry, and we were prepared. And it was fun hiking along through the mist. 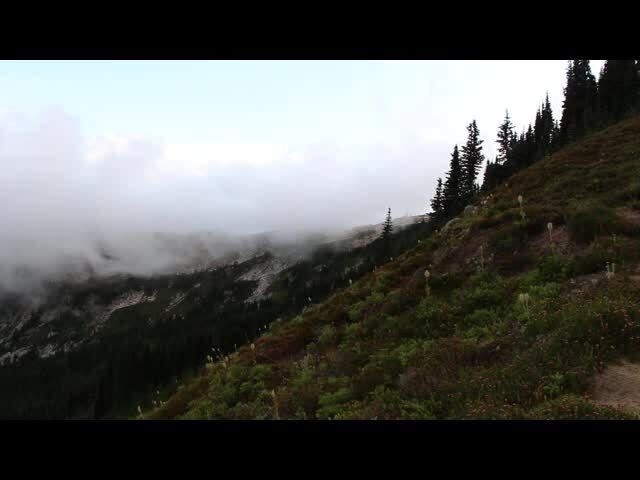 We had no views, but if anything the mountains seemed even more magical in the drifting fog. The air was damp and all the plants smelled wonderful. It was cool and enjoyable, unlike the heat and misery of the past few days, and the best thing of all was that there were no more Deer Flies. Vicki was practically dancing with joy. She really, really hated having bugs constantly in her face. We thanked the weather for this, although in reality their numbers had been dropping for the past day or so. We continued along on the trail, gradually heading downhill all the while. Easy hiking. 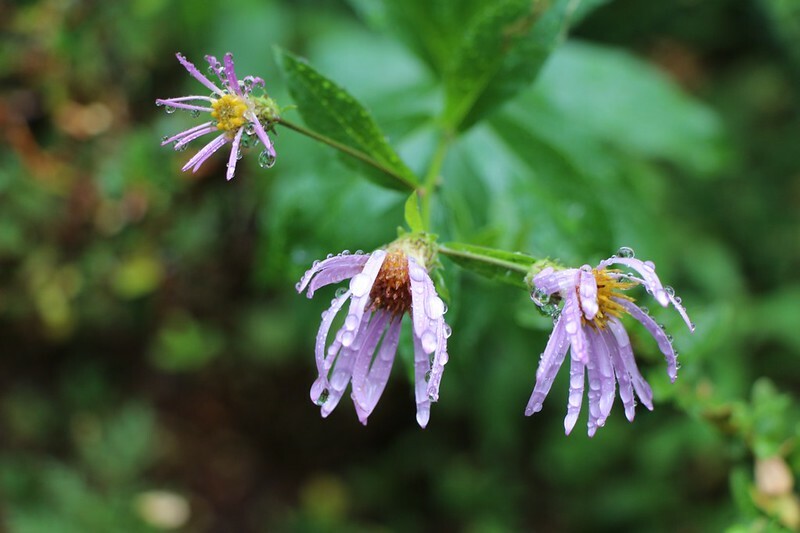 Our shoes and pantlegs were getting wet from having to push through the soggy flowers and grasses that were leaning over the trail, heavy and drooping, laden with raindrops. 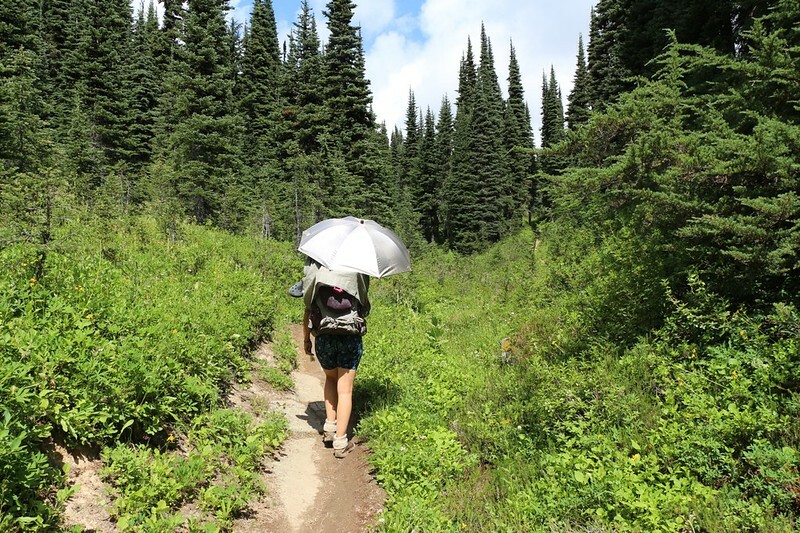 Vicki took the lead with her hiking pole, waving it in front of her like a magic wand, bopping the drops from the leaves and stems. 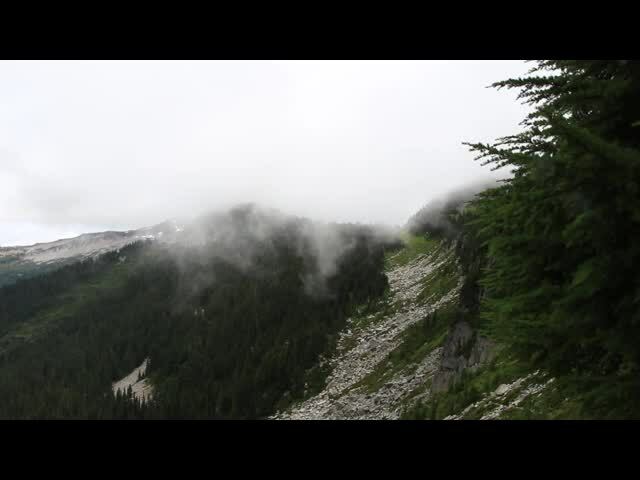 As we hiked along, the clouds traveled faster than us, moving from west to east. Sometimes we’d be in the thick mist, and then other times we could almost make out Middle Ridge across the way. As time went by, we began to see patches of blue sky above us, and the mist became rare. Not long after that, the sun broke through, there were shadows everywhere, and the water drops on the plants glistened in the sunlight. The air was cool and breezy but the sun was warm; it was perfect hiking weather. It was also great photography weather, thanks to the clouds. Big puffy clouds went drifting by both above us and below. Some clung stubbornly to mountaintops in the distance. We watched them forming and swirling in slow motion all around us. What an awesome day! Absolutely beautiful. 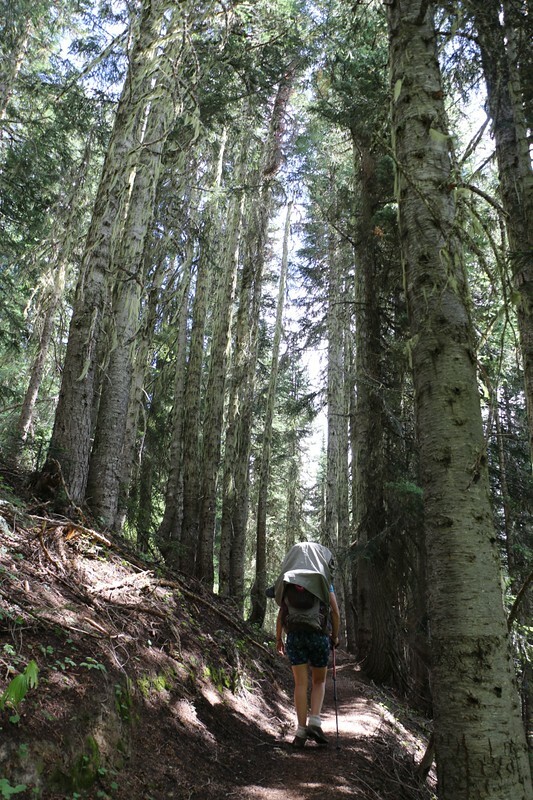 We descended from the high meadows into the forest and joined the Miners Cabin Trail. This section was perfectly flat and easy to hike. Every so often it passed through a meadow or avalanche path and we were rewarded with sunlight and views across the way. 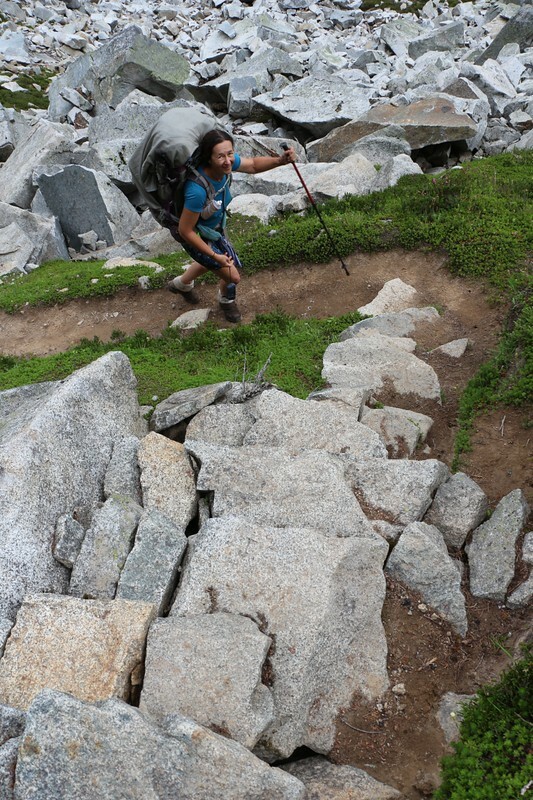 We crossed Plummer Creek and made it back to the PCT, where we’d have to begin a long climb. But we were ready this time. We peeled off our extra clothing layers and ate lunch, adding a bit more snack for additional energy. The difficult part of our day had just begun. 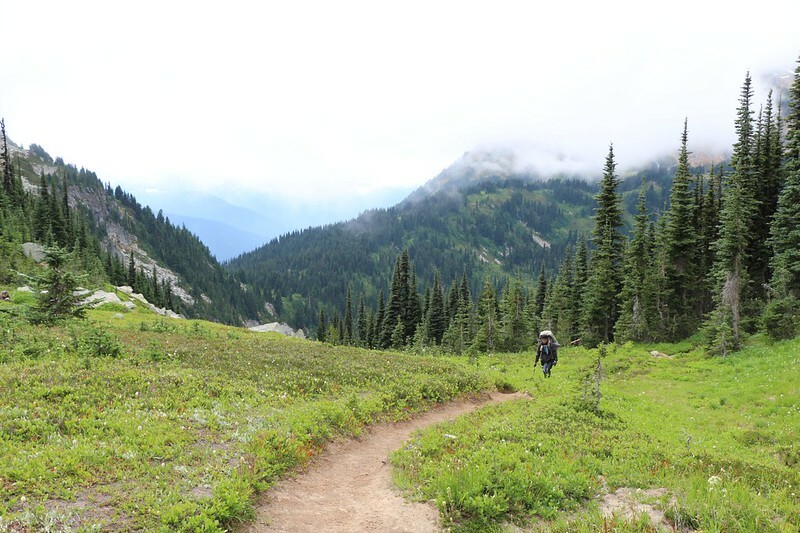 We had about a mile to hike in order to reach Suiattle Pass, and about 500 feet of climbing. It was mostly forested, so we never really got too hot. We just plodded along until we got there. 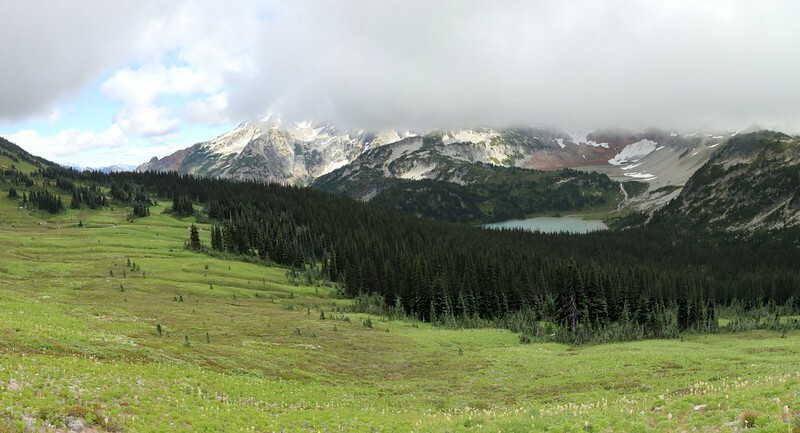 But there we no views whatsoever at Suiattle Pass. Definitely underwhelming. But we made it! And that’s what matters. The PCT continued north, descending into the valley of the South Fork of Agnes Creek, but we weren’t heading that way. 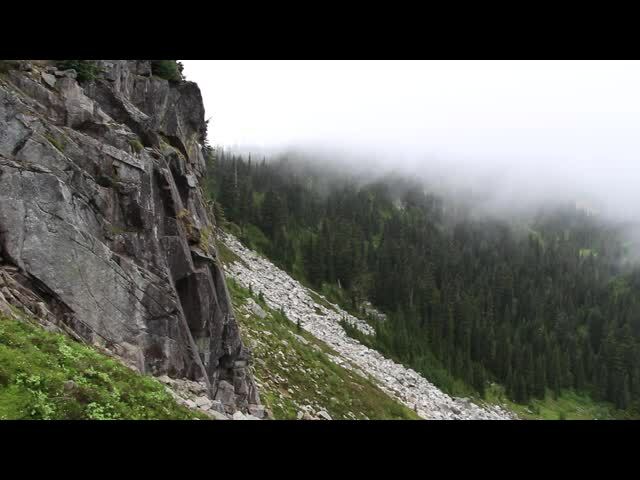 Our goal was to climb an additional 700 feet to Cloudy Pass. The trail to the pass headed off to the east and was called the Cloudy Pass Hiker Trail, and was not recommended for horses. 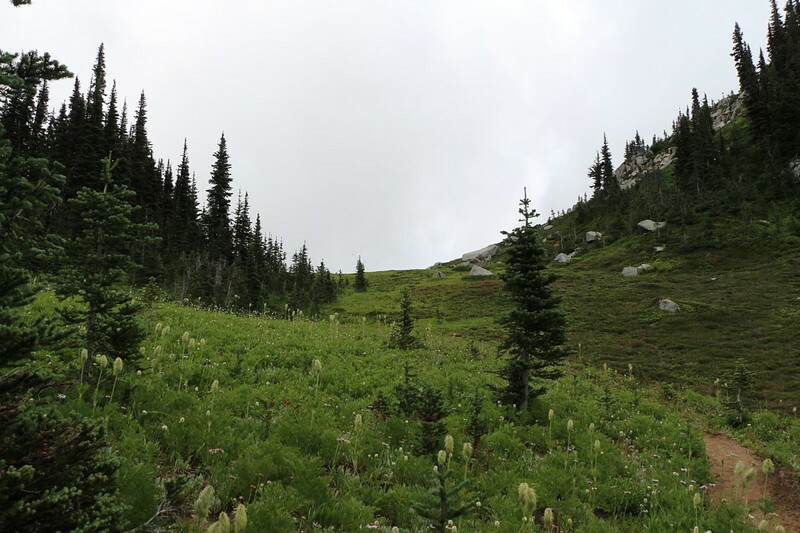 In fact, it’s not even recommended for hikers during most of the year, as it stays very icy and dangerous well into the summer months, being on the steep north slope of Peak 6801 (which we named “Greenie Mountain” because it was so green). 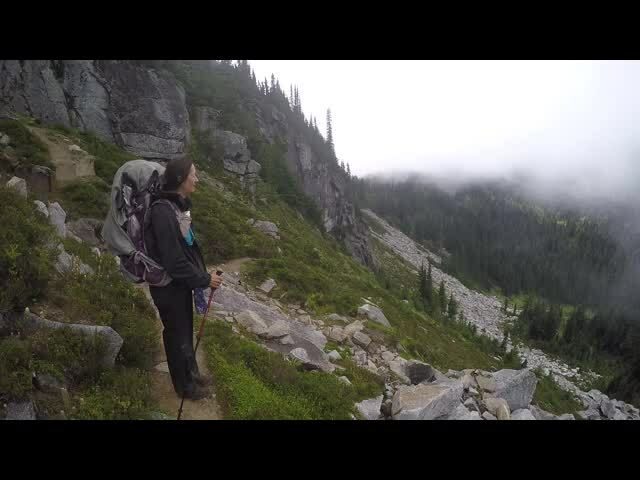 I had read that the trail could get a bit steep and sketchy even without snow, but, as the only alternative was to descend to the bottom by Agnes Creek and then climb all the way back uphill via the main Cloudy Pass Trail, we decided to be our usual adventurous selves. Besides, it looked like fun! And it was. This trail was definitely the highlight of the day. At first it descended a hundred feet or so, which didn’t make Vicki happy, but the views more than made up for it. 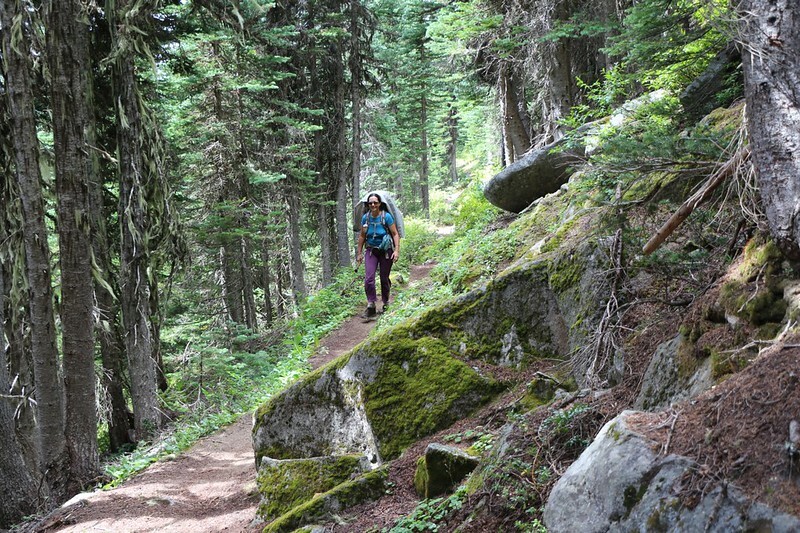 The trail clung to the slope, picking its way among blocks of tumbled talus. To our right was the mountain, but to the left were the views out over Agnes Creek. We could see distant, unknown mountains off to the north, with names like Storm King, Goode, and Needle. The nearby peaks like Dark Star, Cloudy, Plummer, and Sitting Bull would become our friends and neighbors. After our recent climb through the dense forest, the return of distant horizons came as a welcome shock. This was why we hike in the mountains! Meanwhile, it was impossible not to notice the change in the weather. 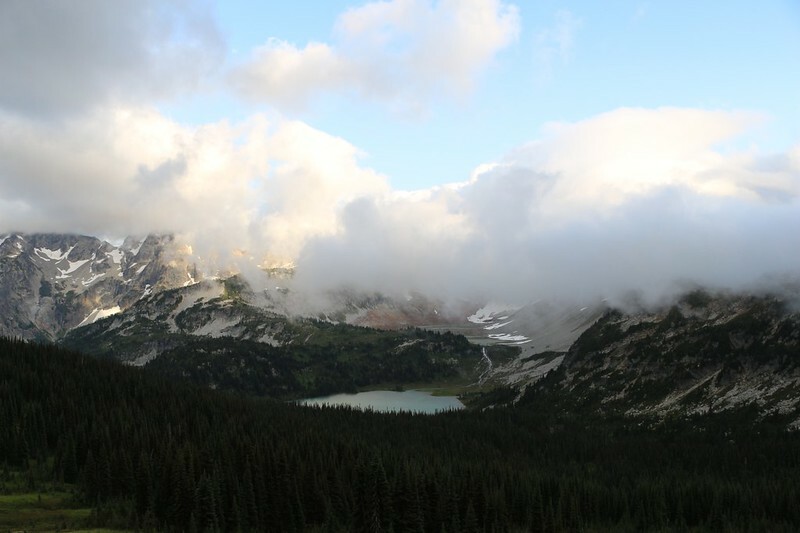 As soon as we crossed Suiattle Pass, the breeze began blowing all around us. The sun remained mostly hidden behind puffy drifting clouds. Sometimes we were inside the clouds. We took satisfaction in seeing that both Cloudy Pass and Cloudy Peak were properly named. The air also got noticeably colder, and we had to stop to put on additional layers. 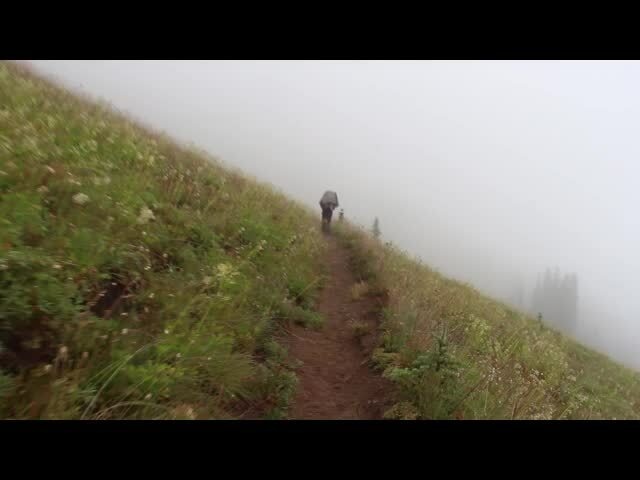 Vicki was shivering and put on her raingear and hood, even though we were climbing uphill. There were spots where the trail got extra-steep, and the stones had been placed like a stairway. In other spots we had to pick our way over boulders. It was challenging, and fun. We were having a great old time. Panorama shot looking north. Cloudy Pass itself is high up on the right. In the clouds, of course! But eventually all fun trails come to an end. 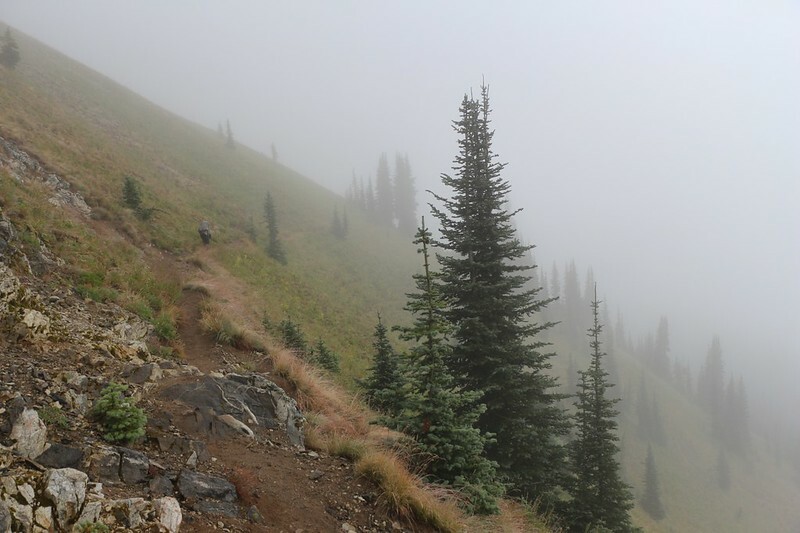 We crossed the final bit of talus and the hiker shortcut joined up with the main Cloudy Pass Trail. This big trail was suitable for livestock, meaning that it maintained a steady not-too-steep slope and had plenty of switchbacks as it climbed. A regular old boring trail. With occasional viewpoints and vistas to make it enjoyable, but let’s face it: It simply wasn’t as exciting as the shortcut trail had been. We were both a bit sad, but we cheered back up when I mentioned tomorrow’s plan: To climb Cloudy Peak! But that wouldn’t happen unless we made it to a campsite on Cloudy Pass, so we buckled down and kept on climbing. 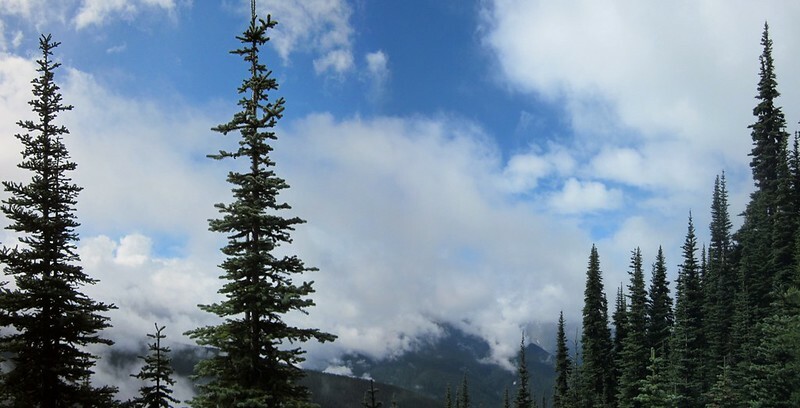 Cloudy Pass, our day’s destination, is only a short ways ahead of us – just a bit more climbing and we’ll be there! Now Cloudy Pass was known for having some extraordinary views, and most of those views were on the other side, the side we hadn’t seen yet, so I was pretty anxious to get there. I had read one trip report online where the author stated that this spot had the “most jaw-droppingly awesome view” he’d ever seen. That’s some seriously high praise. I had seen a bunch of pictures, too, so maybe he wasn’t exaggerating all that much. The images looked awfully pretty, but reality is often far better than photos, so I’d been looking forward to getting up there all day. I kept hiking on ahead, pausing to wait while Vicki plodded slowly on, like the tortoise and the hare. But unlike the parable, I kept wishing that there were rubber bands connecting us, so that I could pull her up the trail even faster. No such luck. Well, Vicki may be slow but she never gives up, and eventually we made it to the top. And the views really were amazing, although there was a cloud layer blowing across the big valley so we couldn’t see everything yet. But it sure looked promising. 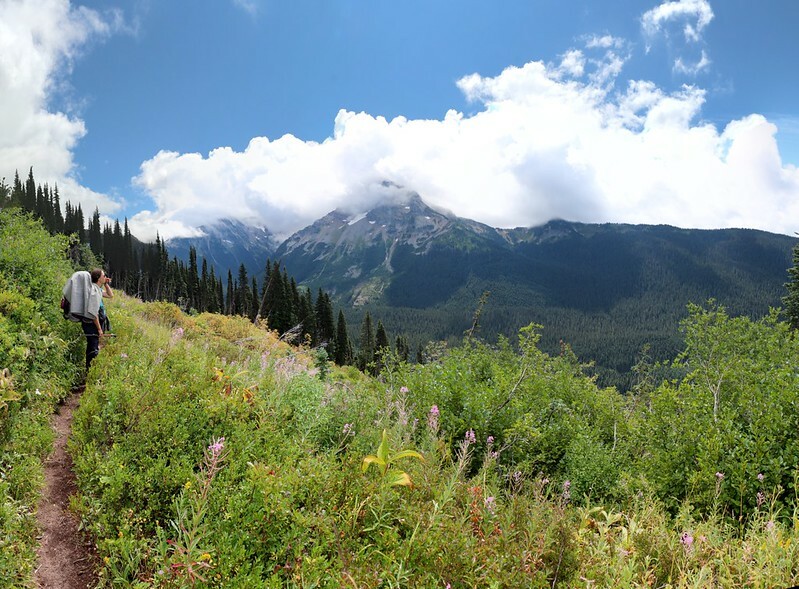 We wandered around the pass, looking down toward Lyman Lake, which was an amazing light blue color. 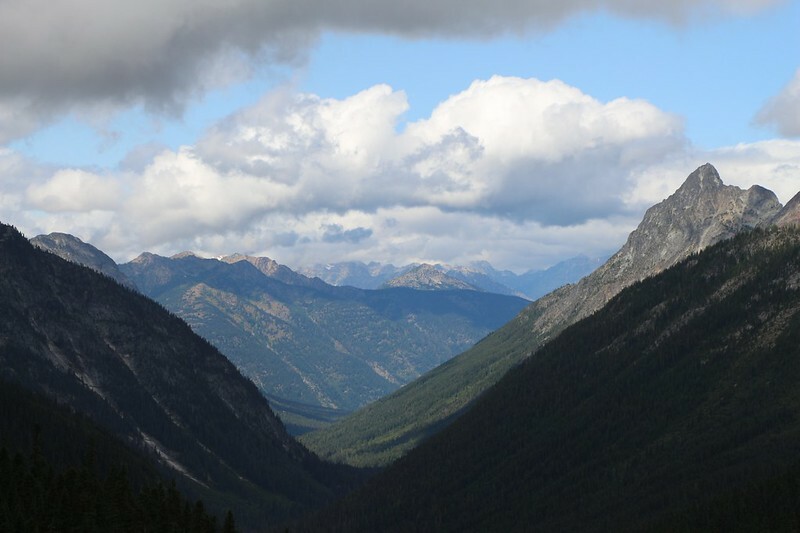 In the distance were mountains and meadows and pine groves and glaciers and waterfalls. This place had a little bit of everything. It was hard not to notice the wind in the pass. It was strong, blowing up and over the pass from behind us, while low clouds and wisps of fog went tearing by over the nearby ridge. We could see that the sun was shining far away to the east, but not around here. It was cold and damp and the wind blew right through our clothing. 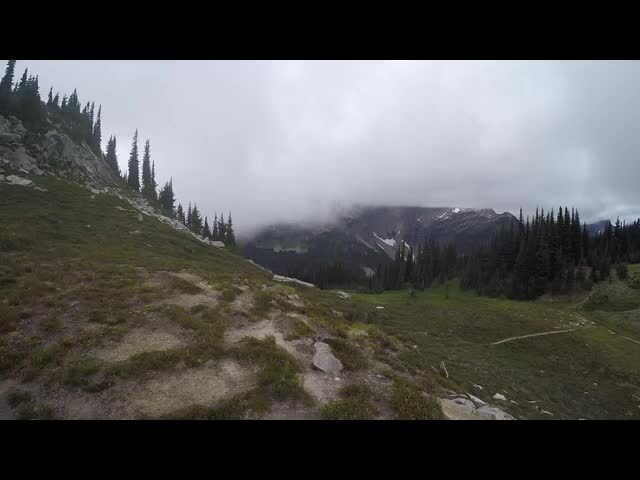 Cloudy Pass was living up to its name. There was a single tent pitched up high on the shoulder of the pass. It was in the very best spot for views, and was exactly where I’d hoped to camp. We climbed up there to say hello. The tent door was open, and a girl was lying down inside it, with her face looking out to the east. We spoke for a bit and she said that her boyfriend was climbing Cloudy Peak at the moment, and should be back soon. We looked up at the peak and it was totally shrouded in clouds. It must have been difficult for her, not being able to see him up there. We spoke about camping spots and she said that this was their second night here, and that on their first night they had stayed a quarter mile down below in the forest at the official Cloudy Pass campsite. They’d moved up here that morning for the views. 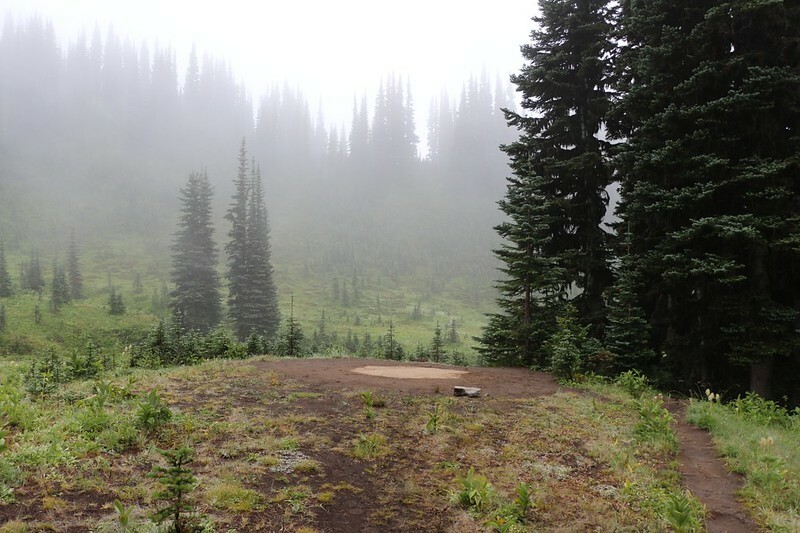 She also pointed out another nice camping spot only a hundred feet away, just across the pass. We thanked her for the info and offered our assistance in case her boyfriend got into trouble. We headed back down and crossed over to the other campsite. Thankfully, it was somewhat sheltered from the wind by a line of pine trees. We decided that this spot was the best place to be right now, in this weather, although it didn’t have great views directly outside the tent door like the other spot. Oh well. We had to get up and take about ten steps to see the awesomeness. What a shame. I think we were getting spoiled. We decided that we would move to the other spot tomorrow, since we planned to stay here for two nights. But first things first. 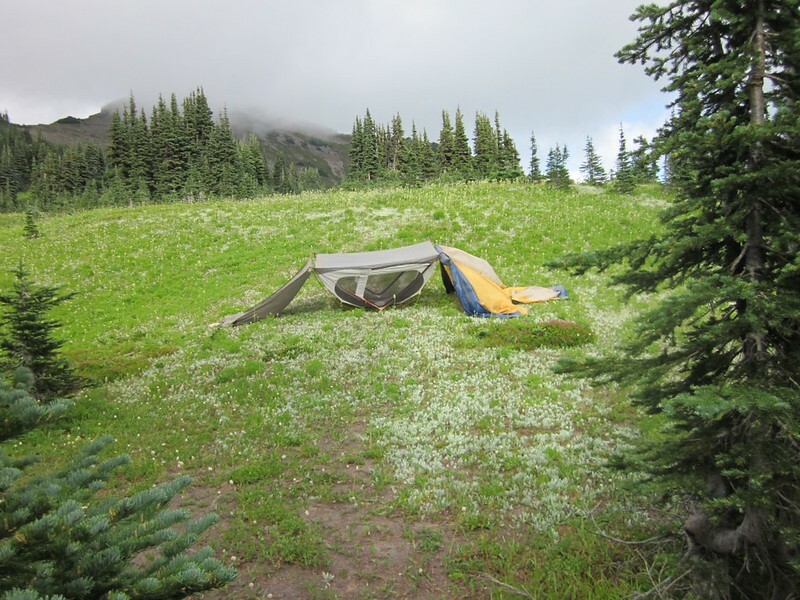 We got out our soggy tent and set it up, but let it sit out in a meadow, upside down, to dry in the breeze. It was only 4pm, so we had plenty of time before sunset. Standing around watching tents dry isn’t exactly exciting, and we were starting to get cold. That’s when Vicki brought out the stove and brewed up some hot chicken broth for us to drink. There’s nothing like a steaming cup of hot salty broth on a cold windy afternoon after a long day of hiking. It was breezy after the storm so we found a campsite that was protected by pine trees. Our neighbor’s tent is on that ridge. 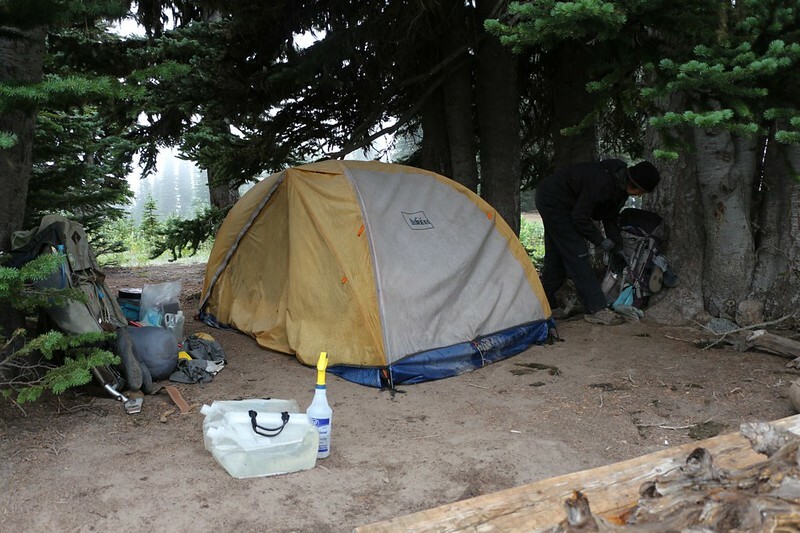 The tent dried fairly quickly and we carried it back to camp. We staked it down and got everything ready for a cold windy night. 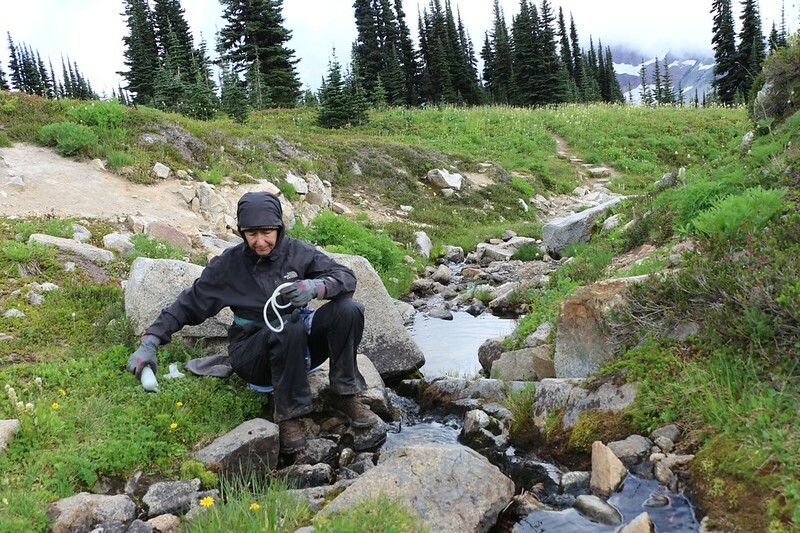 Then we grabbed our water filter and empty water containers and loaded them into Vicki’s empty pack, which I carried. We’d be filtering about three gallons of water, enough for two days. As we headed out, our neighbor arrived across the way. We waved and shouted hello, but it was too breezy to hear anything. We were glad he was OK, and decided that we’d talk to him about the ascent of Cloudy Peak tomorrow morning. Then we hiked down toward the “official” campsite and the creek that flowed nearby. Vicki pumped the water while I took pictures and tried not to freeze. Then we climbed back up the trail to camp. Climbing back to the pass warmed us up a bit, but not nearly enough. We both went inside the tent and got dressed in our night clothing, plus an extra layer including wool hats and gloves. Then we took a well-deserved nap inside the sleeping bag, and that was how we finally managed to get warm. We lay there, listening to the wind blowing high up above the pines as it made its way over the pass. The wind in the mountains is always an impressive sound. We imagined the huge masses of air swirling and whirling, creating friction-screams as they tear into each other, pushing and shoving in their headlong dash to the east. We woke up and Vicki cooked dinner while I wandered around taking photos and videos. It was beautiful up here. 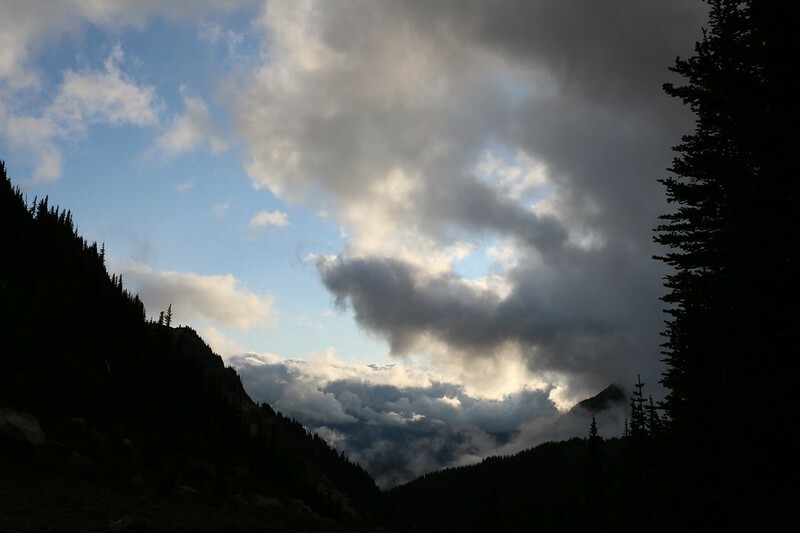 Now I knew why so many of those online trip reports lamented “Oh, I wish I had camped at Cloudy Pass.” Those people didn’t have the luxury of ten days out here like we did. They had to keep on moving if they were going to complete this big loop hike in three or four days. Their lament was, in fact, the main reason I chose to stay here, and not for one, but two nights. Vicki and I looked uphill to the north as we ate dinner. Every so often Cloudy Peak showed itself to us. It didn’t look like an overly difficult climb. 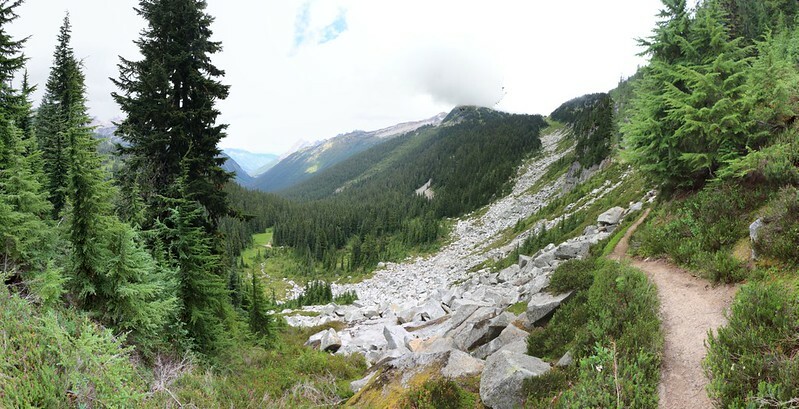 Just some loose talus and a long sharp ridgeline to climb. We were hoping for decent weather tomorrow, but it didn’t really matter, as we were going to climb it anyway. It was our quest, our goal, our destiny. After dinner we took a walk around the pass, looking for views both east and west. It was truly beautiful up here. Both of us were about as happy as we could be. We were in the mountains and we had each other. It was quite romantic. But it was also getting colder and windier than ever! So we headed back to the tent and got inside the sleeping bag. We read our books with our gloves on as the sun’s light departed. Vicki fell asleep right away, but I continued reading by the light of my headlamp, listening to the wind up above in the darkness.